SIDE NOTE !!!!! This has become a nightly routine in the Alsop Home! 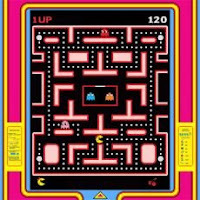 My parents discovered Sky's love for Pac-Man and just happened to leave their plug-in TV version behind one weekend when they saw him playing it during every spare moment he had. (thanks mom and dad) I would like to say that Skylar is now addicted with playing it but I have to add myself to the equation. Gotta love putting off the things you know you should be doing to play a little Pac Man. We are obsessed with beating our own records...since I'll never catch Skylar's. However, for the first time I made it to the "CHASE" this evening and almost conquered the Pear level. It is quite a treat or should I say scare watching Sky play as he is his own worst enemy. "You idiot...you freakin gotta be kidding me!...!" were words I heard coming from downstairs one evening. I went down to make sure he was ok to find him intensely playing Pac-Man. I now know not to respond to these comments and just stay clear. He has become one expert Pac-Man player! We have that little game too and I think it is really hard. You guy must be really good with that joystick, because I can't get past level one. The music is enought to make you crazy.